Tue, Sep 11, 2018, 08:30 pm SL Time, ColomboPage News Desk, Sri Lanka. Sept 11, Colombo: Vietnam Prime Minister Nguyen Xuan Phuc says that steps should be taken not only to strengthen state relations between Sri Lanka and Vietnam, but also to strengthen relations between the political parties in the Parliaments, and between the people of the two countries. 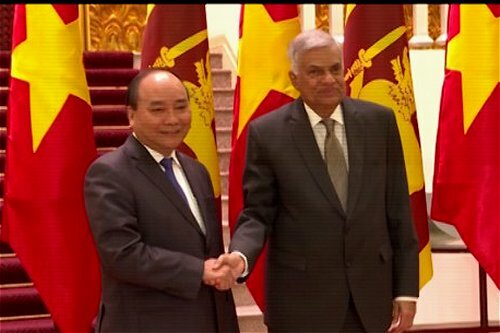 Vietnamese Prime Minister said this during the bilateral discussions held with the visiting Sri Lankan Prime Minister Ranil Wickremesinghe at the Prime Minister's office Tuesday. During the discussion today the two sides stressed the importance of exchanging ideas on launching programs to enhance bilateral ties between the two countries not only in trade but also in political, religious, social, and business sectors. The Vietnamese Prime Minister requested Sri Lanka to support Hanoi in hosting the United Nations international Wesak festival next year. Sri Lankan Premier Wickremesinghe, stressing the importance of exchanging Buddhist delegates between the two countries, suggested forming a joint committee comprising senior scholars to study the historic relationship between the two countries. The Vietnamese Prime Minister's view was that the committee should be established as soon as possible. The two leaders also agreed to hold negotiations soon to further liberalize visa regulations between the two countries to promote tourism. The Prime Ministers of both countries also agreed to make a Memorandum of Understanding on the fisheries sector. A business delegation from Sri Lanka is due to arrive in Vietnam this November. It was decided to organize exchange programs in trade sector. The two leaders also assured that they will be committed to ensure free navigation and peace in the Indian Ocean. Minister Malik Samarawickrema also participated in the discussions.